West German Radio (WDR), a public broadcasting station financed with taxpayers money, asserted that DUS Airport Cargo have severe loopholes in its security system which increase the risk of terrorist attacks. As evidence the WDR TV channel aired a report in which an employee of the airport smuggled in a package that could have contained explosives and deposited the cardboard box in a loaded air freight container. But the good news is: there is no security problem in Dusseldorf. All security measures at the airport are based on international and national laws and regulations, the airport confirms. Therefore they meet the European prescribed, high standards. Congratulations WDR! This film has been a true masterpiece of how not to produce investigative journalism. It was broadcast twice on different days last week to coincide with the start of school vacations in North Rhine-Westphalia, Germany’s largest state by inhabitants, with thousands of travelers flocking to the airports to spend their holidays somewhere abroad. Many of them supposedly with a slightly uneasy feeling when boarding an aircraft are still thinking of the Germanwings crash last March in the Alps caused voluntarily by the First Officer who was severely suffering from depression. In her lead-up to the film the moderator pointed out explicitly that while Dusseldorf passengers are scanned and severely controlled before being admitted to enter the security zone of the airport the risk for air travelers lurks somewhere else, where hardly anybody would expect it: in the cargo area of the airport. Next in the film an employee of DUS Airport Cargo was shown passing through a mechanical control gate after having inserting an ID card. Without further checks the person entered the warehouse where he placed a box in a container of Emirates Airlines that was being prepared for an EK flight to Dubai. Afterwards he returned to where he came from, with no guards or personnel placed at checkpoints stopping him. At no point did he access the apron area, stresses DUS management. 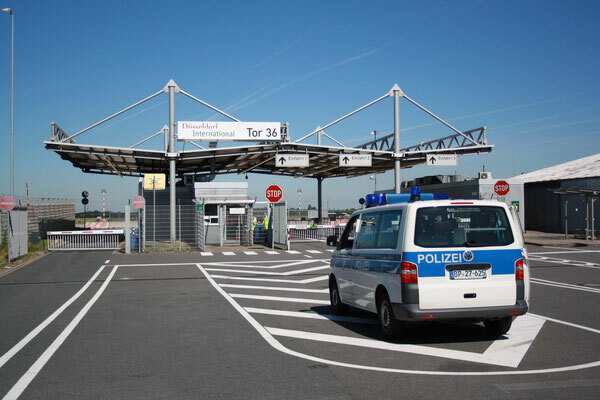 Some days later, a WDR reporter was caught by security people at the visitor terrace of DUS Airport, when he tried to get access to the platform with a gun hidden in his belongings together with a number of batteries connected with wires and taped together. He was charged of breaking the weapons law and handed over to the police for further investigation. What does the TV station want to prove by blaming DUS Airport Cargo of having severely neglected security rules, enabling potential perpetrators to place explosive devices uncontrolled in air freight consignments and risk endangering plane spotters and aircraft from being fired at if controls at the visitors terrace were not performed according to security rules? What did the WDR aim at? The more dramatic and shocking the contents of a film appear to the broader public, which ensures a rise in the station’s quota of viewers. Was this the WDR’s aim when broadcasting a doubtful report that supposedly scared a lot of people and kept them back from flying and which was talk of the town the days after? At least, those are the impressions neutral observers got after having analyzed the dubious methods of how this report had been made and the lack of credibility of many of the allegations aired by the WDR. For example, some sequences recorded months ago, illustrating security checks at gate 36 were blended with current pictures showing the employee passing through a control station by slotting in an ID card carrying a package in his hand. Asked about these sequences the airport accused the film makers of having omitted telling the viewers that at DUS and any other German airport the loading of containers is subject to the multiple eye principle, safeguarded not only by security personnel but also monitored by cameras placed at various sites at the airport’s cargo area. Dusseldorf Airport spokesman Christian Hinkel assured CargoForwarder Global that the double or even triple-eye principle led to the removal of the package smuggled in by the airport employee before the container was loaded on board the Emirates aircraft. According to information obtained by CargoForwarder Global, the faked device never got to Dubai as insinuated by the movie makers but ended up at a garbage can in DUS. In a letter to the TV station DUS Airport outlined - from their point of view - a number of fundamental errors the authors of the WDR report made leading to confusing or deceiving the viewers, insinuating that the cargo business at the airport was insecure. This all the more after the German regulator LBA had attested that DUS Airport Cargo‘s security scheme is faultlessly functioning only days before the WDR report was transmitted. “We haven’t got any response on our letter from the WDR,” regrets Christian Hinkel. “Neither did the TV station inform us prior to broadcasting the report, thus denying us the possibility to articulate our perspective on things,” he regrets. Good style and fair treatment looks different. Last remark: The employee that smuggled in the faked explosive device has meanwhile left DUS Airport Cargo. The question still remains as to whether DUS Airport will initiate criminal proceedings against the former employee.